While Apple is an American company, its products have, to an extent, become inextricably linked to China, home to many of Apple's suppliers. A new infographic, though, shows that Apple draws materials, components, and services from nearly every populated continent on the globe. ChinaFile and Tea Leaf Nation came together recently to publish "Who Supplies Apple (It's Not Just China): An Interactive Map." Building on data from Apple's own Supplier Responsibility Report, the graphic shows that Apple's suppliers come from nearly every corner of the world. True, the majority of these suppliers are in southeast Asia  and the majority of those in China  but North America, Europe, South America, and Australia are also represented. "So many people, when they think Apple, they think 'Made in China.' Yes, there are a bunch of suppliers in China, and a bunch in Asia, but you zoom in and you see it really spread around the globe." "You know, it's funny," says David Barreda, photo editor for ChinaFile, in an interview with AppleInsider. Barreda created the supply chain map with Tea Leaf Nation's David Wertime. "So many people, when they think Apple, they think 'Made in China.' Yes, there are a bunch of suppliers in China, and a bunch in Asia, but you zoom in and you see it really spread around the globe." Barreda says the two hatched the idea to develop the supplier map in order to show not only the relationship between the United States, Apple, and China, but the way the iPhone maker touches much of the world. Building out the graphic was easier than the final result might lead one to believe. "Really, we just took information that's out there," he said. "We became aware that Apple publishes this work at the end of January. You see a list of companies and a list of addresses, yeah, but it's difficult to put a visual to that. The funny thing is that none of us are Apple experts or anything. We just saw the information and thought of the Apple-China connection, and decided to run with it." "The funny thing is that none of us are Apple experts or anything. We just saw the information..."
He says making the information visible in the way that they've done could help viewers to realize the interconnectedness of their world, if only by seeing how much of the world plays a part in making their favorite electronic devices. "I think that this information has been reported on previously," Barreda continued, "but displaying it visually lets readers see it another way, hopefully a more tangible, real way." A glance at the map makes it readily apparent why people think "Made in China," despite the company's wide reach in drawing from suppliers. 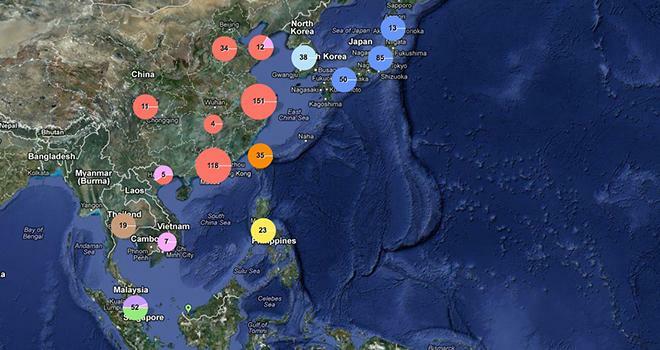 Southeast Asia hosts more than 80 percent of Apple's suppliers. China plays a considerable role in this, but so too do Sharp facilities in Vietnam, as well as semiconductor plants in the Philippines. Indonesia yields tin, used in soldering of electronics. The list goes on, touching virtually every major economy in the region. Outside of that dense concentration of suppliers, though, Apple draws on other resources worldwide. Arvato Digital in Australia, Vishay and Intel facilities among others in Apple's expanding Israeli operations, STMicroelectronics in Sicily, and fully 76 suppliers in the United States. "...Apple comes up and, there'll be somebody who says, 'Oh! I'm from a small town in Pennsylvania... and Apple makes this there!' and then it really hits you how big this whole thing is." According to Barreda, that last fact strikes some people as surprising, even though Apple is already making some components  and planning to make more  in its home country. "You know, you'll be around the office or something," he said, "and Apple comes up and, there'll be somebody who says, 'Oh! I'm from a small town in Pennsylvania or somewhere and Apple makes this there!' and then it really hits you how big this whole thing is." Asked about possible future uses of the visualization, Barreda says he is confident that people will find unique ways to implement the information. "I saw it and was like, 'Gosh, this is a great tool,'" Barreda explained. "And hopefully that's how others will see it. Hopefully this will be a tool that journalists and researchers and others can use. That's another of our missions as a nonprofit." 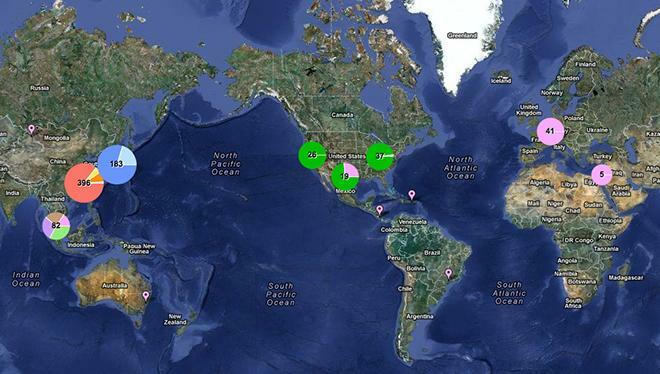 Having just completed and posted the map, its designers aren't going to quickly turn around and begin adding features. That said, Barreda sees potential for cross-referencing data with the suppliers' geographical information. "Another thing that our center does is that we have a strong interest in environmental issues, especially with regard to the United States and China, but also throughout Asia. So an environmentally-oriented take on the data, that's something we're going to maybe take a look at in the future." Possible applications include environmental impact studies showing the extent to which Apple's suppliers are responsible stewards of the land, air, and water resources surrounding their facilities. Barreda was also open to the possibility of political impact studies, as well as economic impact studies. "We see the situation better when we have access to better information." Barreda pointed out more possible benefits from the data, noting that a better understanding of the geographical, social, environmental, economic, and political impacts of large multinational corporations like Apple could help bridge the geopolitical gap between countries like the United States and China. "I think that [giving better access to] this information does enable progress in improving international relationships," he said, summing up. "We see the situation better when we have access to better information."